A civilian airline has been attacked and worldwide political tensions are rising. As secret agent Michael Thornton your path is open and your options are unlimited. In the first modern day espionage RPG your greatest weapon will be choice. 05-23-2017 silverbow Box Text Your Weapon Is CHOICE Accomplish your mission with stealth, firepower, sabotage, and charisma. Decide how the story plays out based on the choices that you make. A civilian airline has been attacked and worldwide political tensions are rising. As secret agent Michael Thornton your path is open and your options are unlimited. 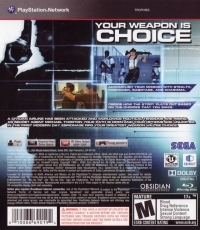 In the first modern day espionage RPG your greatest weapon will be choice. 01-16-2012 solidgear3 Description The year is 2009. Worldwide political tensions are at a breaking point when a commercial airliner is shot down by a U.S. missile over Eastern Europe, killing all aboard. The U.S. government claims no involvement, and dispatches Agent Michael Thorton to investigate and bring those responsible to justice. 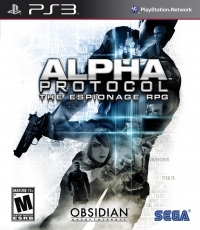 As the first modern day spy role-playing game, Alpha Protocol offers unprecedented control over the development of Thortonï¿½s abilities and his interactions with other characters. Upgrade skills such as physical combat, weapons mastery, cutting-edge technology and even seduction as you grow in experience and complete missions.